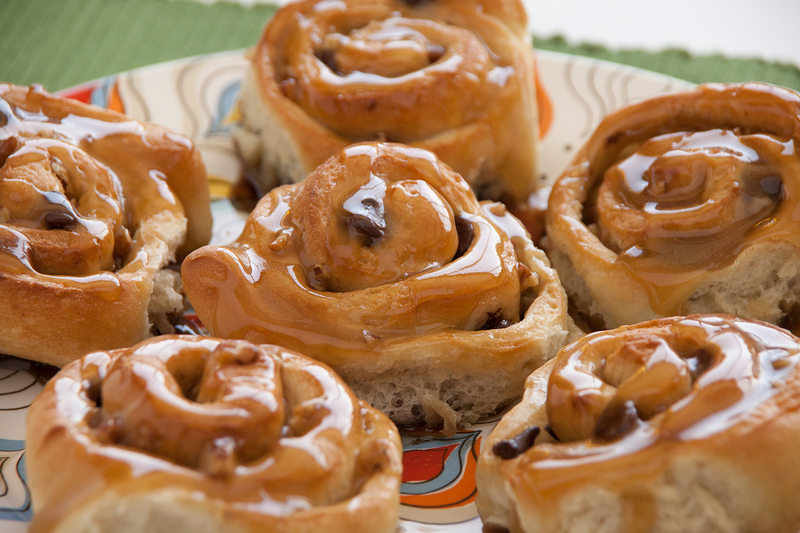 Chocolate and pecans combine to make this delicious sweet roll. Spray counter lightly with non-stick cooking spray. Combine rolls and roll into a 12×16-inch rectangle. Combine butter, brown sugar and corn syrup in a small pan. Let come to a boil over medium heat. Allow to boil for 1/2 minute and then remove from heat. Let sit until slightly cool. Spread half of the sauce over dough. Combine chocolate chips, chopped pecans and 1/3 cup brown sugar. Sprinkle over dough. Roll up starting on a long side. Cut rolled dough into 12 equal pieces and place in sprayed 9×13-inch baking pan. Cover with plastic wrap and let rise until double in size. Remove wrap and bake at 350 degrees F 12-15 minutes or until golden brown. Drizzle remaining sauce over warm rolls.